You want to build a fixed state of the art usability lab? The monitor signal of the PC goes into the screen recorder and is recorded as a MPEG 4 file. During the test session, the signal is loopthroughed and displayed live on a monitor in the control room. The audio signal goes from the microphone into the digital camcorder. The video and audio signal from the digital camera goes via FireWire into the recording PC and is recorded as a digital file. 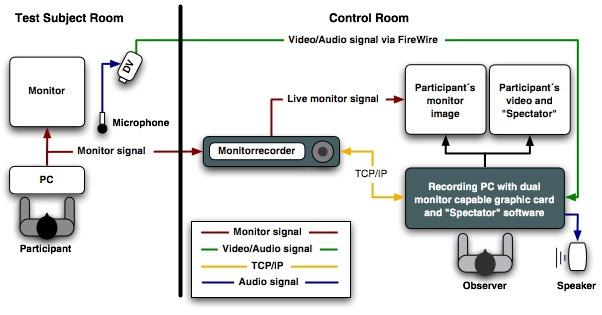 Your recording PC is connected with the screen recorder via an ethernet cable to control the screen recorder (Start/stop recording, transfer MPEG files). The participant video and theSpectator software are displayed on the second monitor of the recording PC simultaneously. During the session the videos (monitor and participant) are recorded and synchronized. You can code the behaviors and mark interesting scenes with the shortcuts you defined in the configuration of the Spectator software. When you stop the recording the monitor video recorded on the Screen Recorder will be automatically transferred to your recording PC. The software can replay all recorded videos of a session synchronously. Slow motion is support too. Edit your codings you’ve made during the session, insert additional comments and more. You can bundle the videos and your codings on a CD (one click) with the free “Spectator Player” software and distribute the CDs so everybody can watch the interesting scenes using the bookmarks you’ve made in the videos. To expand the standard system shown above you can obtain additional equipment.